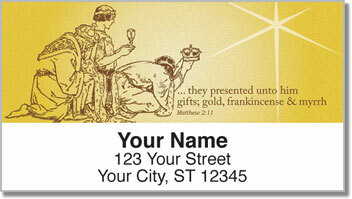 These return address labels tell the real Christmas story. It happened more than two-thousand years ago in a little town called Bethlehem. 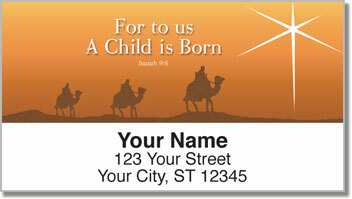 A baby born in a manger was unlike any other human being to walk the Earth. This was the beginning of a life that would change the world forever. It was the beginning of our redemption. 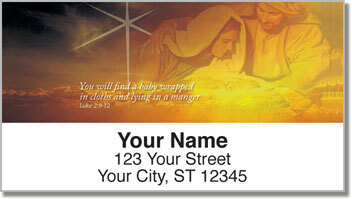 Use these holiday-themed address labels to spread a message about what this season is really about. Stick them on all your Christmas cards for a beautiful finishing touch. You'll also appreciate the self-adhesive backing, which allows you to simply peel and place your labels on all outgoing mail. 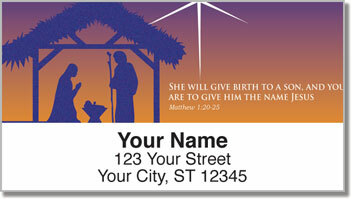 Get your very own Nativity Scene Address Labels today! Order them with matching personal checks.